During the nine years I spent with the Tahoe Nordic Search and Rescue, I witnessed a lot of unnecessary tragedies as a result of unmindful preparation—tragedies that may have been avoided entirely if the individual had a few simple items. More than 1,300 people per year die from exposure related to natural cold, according to the Centers for Disease Control and Prevention. That’s a lot of people if you think about it. While I can’t say exactly what the circumstances were, I can assume that lack of preparation played a major role in these unfortunate incidents. Shelter, water, fire and food is the order of survival. The rule of threes states that you can live for three minutes without air, three hours without shelter, three days without water, and three weeks without food. Three hours without shelter, really? . . . Really! Always make sure you have these five items in your pack no matter what. A full tang knife, meaning the blade extends the entire length of the handle, with at least a four inch blade is your best survival item. Don’t waste your time with trendy folding knives because they simply won’t suffice if you have to baton wood or do heavier work. Try building a shelter, making a fire board or chopping with your over-priced pocket knife. You can save it for impressing your girlfriend because that’s about all it’s good for in the woods. If you go into a survival situation without it, I guarantee you’ll wish you had it. Good for about a million things paracord is lightweight and compact. Sure a lighter is quick and easy but they are mechanical and prone to failure. Get a magnesium block, a ferro rod or something bulletproof and simple. I like the magnesium the best. Also, bring a box of matches in a pill jar or some other waterproof container. There are dozens of commercially available choices. Having a flame or making sparks looks pretty, but unless you have a bomber source of ignition (especially in windy/wet conditions) you might as well throw it into the bushes. Smear some cotton balls with petroleum jelly or buy commercial tinder. I like to have natural tinder with me. Just make sure you keep it dry and you’ll have a good chance of getting fire. Most water in the wild is unsafe to drink. If you don’t have a filter (most people on day hikes don’t), you can use your container to boil water or to melt snow. 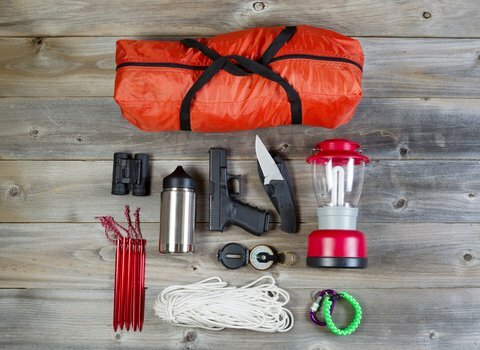 All of these items combined can easily fit in a day pack and might just save your life. A little bit of preparation can make all the difference and keep you from becoming another statistic.